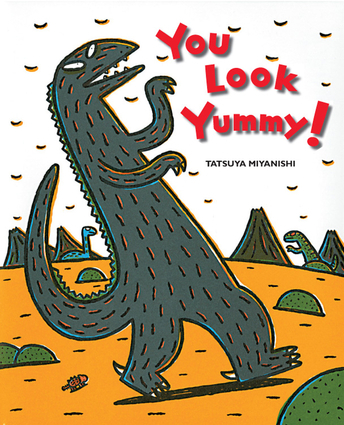 This sweet tale about the love between father and son is the first in a tremendously popular Tyrannosaurus series in 12 titles to date, with combined sales in excess of 3 million copies in Japan, China, Korea, Taiwan and France. A long, long time ago, a baby Ankylosaurus is born on a volcano erupting ground. As the little Ankylosaurus begins wandering around, a big Tyrannosaurus comes along. He is about to pounce when the baby cries out, "Daddy!" and grabs onto his leg. The baby thinks the Tyrannosaurus is his father, so as not to disappoint the little one, he takes on the task of raising a baby Ankylosaur. The two develop ever stronger bonds of love, but soon comes the day when they must part. Highlighting the importance of family, this sweet picture book celebrates the love between father and son. Born in 1956, Tatsuya Miyanishi is one of the most popular childrens book artists currently in Japan. A graduate of the Nihon Universtiy College of Art's Fine Arts department, Miyanishi is an artist in almost a renaissance sense. His children's books cover a wide range of genres from superheroes to dinosaurs and everything in between. He has won the Kodansha Cultural Award in the Picture Book category, as well as the Kenbuchi City Picture Book Village Award.